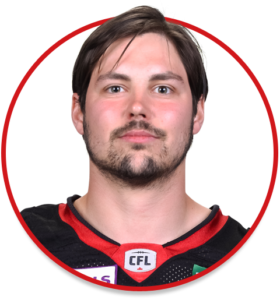 Antoine Pruneau is a Defensive Back currently playing for the Ottawa REDBLACKS. Improved on his 2015 campaign with 58 defensive tackles … Had a sack and an interception, along with 11 tackles on special teams. Built off stellar rookie season by balancing the roles of being a SAM linebacker and a special teams player … Recorded 52 tackles, a team-high 18 special team tackles, two interceptions and one forced fumble in 2015 … Recorded five tackles and three special teams tackles during a come-from-behind overtime win over defending Grey Cup champion Calgary on July 24 at TD Place … Nominated as the team’s rookie of the year for the 2014 CFL Player Awards … First CFL start Aug. 9 at Calgary. Started at linebacker … Had eight defensive tackles … Followed with a 10-tackle performance the next week, Aug. 15, vs. Edmonton at TD Place.